After recent episodes of violence at council and board meetings around the country, Springdale will now have a uniformed officer at its city meetings. 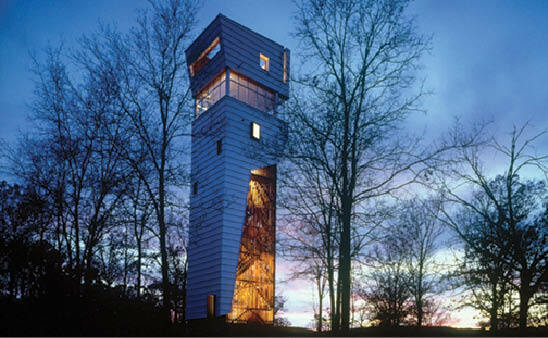 The Towerhouse off of Old Wire Road in Fayetteville. The Towerhouse, one of Fayetteville’s most unique homes, has been broken into several times of late but police think they caught the intruder. Newly elected House Representative, Steve Womack says he will not let the events of Tucson last week change how he meets and greets voters. The Centerton city council member who was allegedly threatened by another council member and who had resigned from her position is now back on the council. Apparently during her hiatus her seat was up and she was re-elected. On Monday several Rogers families were fooled by a fake Twitter account that reported school was closed due to weather. Local station KNWA even reported it on the Sunday night broadcast. The smallest Wal-Mart in the world just opened on the campus of the UofA. It’s official! We now have a Waffle House on Dickson St. You can get it smothered, covered, and chunked inside Underwood Plaza. Remember the Butcher Block Steakhouse? How about S & J Seafood? Well the building that once housed them both is going to finally be razed along with the former Bill & Tony’s Liquor. A Kum & Go convenience store will be built on that corner. The annual Paint the Town Red fundraiser for the American Heart Association is Saturday. The “party with a purpose” is usually one of the more entertaining of these fancy balls. Apparently Arkansas Offensive Coordinator Garrick McGee will not be heading to Tulsa.